Last year John Martin’s Hidden Notes quintet went into the studio to record an album, and we ended up with two! (Well, one double album anyway). I’m really looking forward to going on tour in the Summer to promote the new record. Dates are on the lovely poster below (and on my Gigs page). Mosaic is playing at Oliver’s tonight in our first performance of 2016, which is set to be a big year for us. In just under a month’s time we’ll be at Real World Studios recording our first album, which will be out in September on Edition Records. In anticipation of all the exciting developments I’ll have to share over the next few months, I’m starting a newsletter, which you can sign up for using one of the boxes around the website, or at https://tinyletter.com/Ralphwyld. As well as news and updates (think sparse but interesting; not constant, dull and spammy), there may well be some exclusive insights for subscribers! The gig tonight starts at 9, and we’ll be leading a jam after our set so please come and listen/play. Unfortunately Sam Rapley isn’t around so completing the usual line-up is the wonderful Greg Barker on clarinets. Recently I was part of a very special project, bringing together the James Taylor Quartet and the Rochester Cathedral choir in a mashup of funk and sacred choral music. We premiered the mass at the Queen Elizabeth Hall back in April, before performing it in Rochester Cathedral, and then recording it in one day during the summer. You can buy the album as a vinyl direct from the label here, or as a CD/download on Amazon. Had a nice weekend of Jazz Festival gigs, the first with John Martin’s Hidden Notes project at the Royal Albert Hall (admittedly the Verdi Restaurant in the Albert Hall, not the main arena…). It was great to see so many people in attendance despite the torrential rain, and the awful events of the night before. This was followed on Sunday by Mosaic’s first LJF gig, at the lovely Omnibus in Clapham. It’s always a great place to play, with a friendly atmosphere, and we enjoyed returning to the setting of our debut gig last year. Thanks to everyone who came down to hear us, and to Sue and Omnibus for being so welcoming. The focus for Mosaic now is recording an album to be released towards the end of 2016. It’s time for me to go away and think carefully about the music we’re going to play, and what it’s going to sound like. Exciting times ahead. I continue with the Jazz Festival tomorrow (Wednesday) evening with Yazz Ahmed at Ray’s Jazz, then Rick Simpson’s Klammer on Thursday at the Spice of Life. Meanwhile, I’m involved in a brand new project called Pacha Mama , which is a quartet of Trombone (Vij Prakash), Violin (John Garner), electric bass (Ed Ireland), and vibes. We played our first gig last week at the Guildhall jam session, and we’re following that up with Cambridge Jazz Festival this Friday (20th November). The venue is Hot Numbers, where I played a few weeks ago with Tom Hewson. As well as the music, I’m looking forward to picking up some more of their in-house roasted coffee! I had a great time over the weekend playing with the James Taylor Quartet at the Blue Note Milano. I’ve been part of the larger James Taylor ensemble in the recent Rochester Mass projects, but this was my debut with just the Quartet, and we played 6 shows over 3 nights. I’m now back and fully caught up on sleep, ready for some gigs in the next few weeks. Tomorrow night (24/09) is Rick Simpson on the Golden Hinde II, home of the Jazz Nursery. Then the following day, I’m playing with Yazz Ahmed’s trio again, at Embrace Arts in Leicester. Next week I’m lucky enough to be involved in two premieres. The first, on Monday 28th September, is the debut of Noel Langley’s Edentide Ensemble (in fact, it’s Noel’s debut gig as a leader) at Jazz in the Round. Then Saturday 3rd October sees the result of Yazz Ahmed’s Jazz Lines fellowship, with some brand new music performed at the CBSO centre by her Hafla band with guests Jason Singh, Brigette Beraha and Alya Marquardt. Recording James Taylor’s Rochester Mass today at Angel Studios. A four star review for the Tim Richards Hextet album in the Observer today. I’m delighted to announce that I am the 5th winner of the Kenny Wheeler Prize, awarded by the Royal Academy of Music and Edition Records. As a result, Edition will release my debut album which will feature my ensemble Mosaic. Lovely location, and the weather to match, for this evening’s gig with Yazz Ahmed at Kew Gardens! Final reminder: Tomorrow night is going to be fun (if you come to the Vortex)! Very much looking forward to the musical party that will be our gig at the Vortex tomorrow night. We’re sharing the bill with JJ Wheeler’s epic 10 piece ensemble Come Back Stronger, which I am also in, playing his thought-provoking suite A Question of Hope. If you haven’t heard this yet, I would highly recommend checking it out – it’s a powerful insight into living with cancer, from a brilliant composer. Mosaic will be playing the second set, and we have back with us the wonderful Scott Chapman on drums (and glockenspiel). Tickets are available (and cheaper) online, and there’s a Facebook event too! Post by Ralph Wyld’s Mosaic. I’m delighted to announce that I’ve won the Dankworth Prize for Composition 2015. My piece Subterranea was awarded the prize in the small band category, and you can hear Mosaic play it live on 1st March in the “LUME presents” series at the Vortex! Debut for "All in the Golden Afternoon"
For the first time ever, I’m lucky enough to be playing with both Mosaic and Element in the same week! As the above tweet states Mosaic are at the Oxford tonight, following last week’s cancellation. I’m very grateful to George at the Oxford Jazz for sorting out another date for us so quickly. We’ll be playing the second set, with music about a painting, tango (the dance, not the drink), and underground rivers. You can hear Mosaic here. Then on Wednesday, it’s Element’s turn. We’re playing for the Way Out West Collective at the Bull’s Head in Barnes. If you haven’t been down and seen the new music room there, Wednesday is the perfect time..! We’ll be playing some of our classics, as well as some new contributions from Rod Oughton, and standards in our own style. Mosaic at the Oxford: we're back! Incredibly, the wonderful Jazz @ the Oxford have managed to fit Mosaic in this Monday (26th January)! It will be a double bill with George Crowley’s Can of Worms. If you were intending to come last Monday, I hope you’re able to join us. Unfortunately, due to circumstances out of our control, the gig tonight has had to be cancelled. We’ll be back soon though, at the Vortex on 1st March if not before! I had a great time in a busy and varied London Jazz Festival this year: from packed, vibey rooms like the Green Note with Rick Simpson and The Con with Mike Chillingworth (review), to the expansive and luxurious Queen Elizabeth Hall with the Royal Academy of Music Big Band with Nikki Iles (review) and the Yazz Ahmed Family Hafla (review). The festival also saw the official album launch of the Sam Eagles Quartet debut record, which was held at the Pizza Express Jazz Club (artwork from the gig by Alban Low here). The tour with this band continues with Torfaen Jazz tonight, followed by Leeds, Newcastle, London and Southampton next week. See the gigs page for more information. The Con Cellar Bar was sold out on Friday last week for Liam Noble and Mike Chillingworth, however Mike’s band has another gig on Monday at the Oxford, so if you didn’t hear it in the jazz festival and you want to see what you’re missing, come down! Finally, I have some 2015 dates for my own ensembles. The collaborative trio Element, with Rod Oughton and Flo Moore, is playing at the Bull’s Head in January. Also in January, Mosaic is playing at the Oxford. We’ll be playing again in April (EDIT: actually it’s moved to March…) at LUME. Again, details on the gigs page. Had a great time last weekend playing with Tim Richards’ Hextet and Troykestra. Tim’s album is now available on Bandcamp, with physical copies to follow next year. Troykestra’s award-winning album is also on Bandcamp. This year’s London Jazz Festival is now underway, and my participation in it began last night at Oliver’s, with the John Martin Quintet. 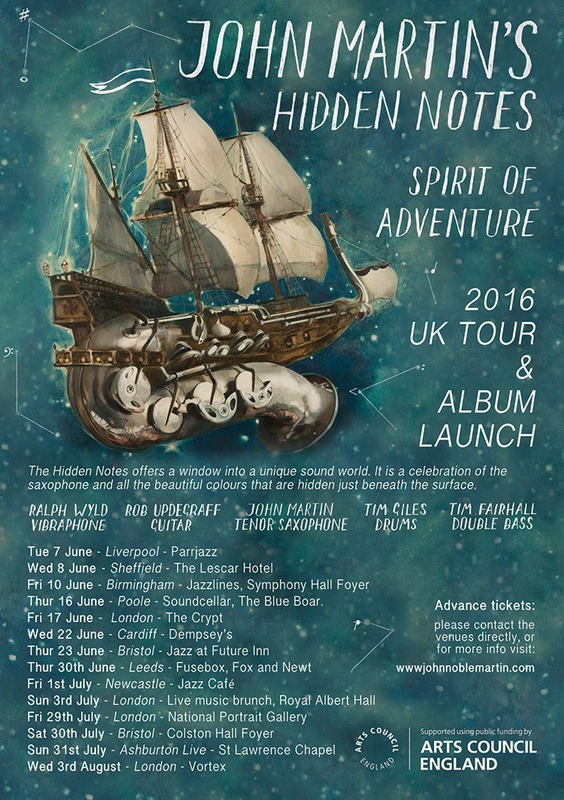 John’s project, The Hidden Notes, is “a celebration of the saxophone and all the beautiful sounds that are hidden just beneath the surface.” We’re playing again today, in just a few hours, at the Forge in Camden. If you miss this, we’re also playing at King’s Place in December. Sunday is the official album launch of Next Beginning, the debut record of the Sam Eagles Quartet. The gig is a double bill at the Pizza Express Jazz Club with Leo Appleyard, who is also launching his album. This forms part of our tour, and still to come are gigs in Torfaen, Leeds, Newcastle, Brighton and Southampton. On Tuesday (18/11/14) and Friday (21/11/14) are performances by two bands who both have a focus on through-composed music. Tuesday is Rick Simpson’s Klammer at the Green Note, and Friday is Mike Chillingworth’s Septet at the Con Cellar Bar. On Saturday 22nd November, I have two gigs in the Queen Elizabeth Hall. The first is with the Royal Academy of Music Big Band, playing with (and the music of) Nikki Iles. There are some great tunes, and arrangements by Nikki and Stan Sulzmann among others. Later that day, I’m playing with Yazz Ahmed in a double bill with Regina Carter. The following day, Yazz’s band is playing again at the Vortex. Element are undertaking a miniature tour of the South-East tonight and tomorrow. We begin with London’s Vortex at 8.30pm, where we’ll be supporting ARQ for their album launch. We then head down to Fleet, Hampshire, where on Thursday morning we will play for the children of All Saints Junior School. Following that, we cross fleet to All Saints Church, where we are playing at 12.30 in their “Midweek Concert and Lunch” series. Mosaic at Omnibus Clapham, 8th June 2014 - Preview! In a little under 24 hours my new ensemble, Mosaic, will make its debut performance! The culmination of 6 months of composing, planning and rehearsing, the gig will feature six new compositions by me (all world premieres), as well as two new arrangements. I’m very lucky to be joined by some fantastic musicians and personalities, who have put so much into the music: Sam Rapley (clarinets), James Copus (trumpet/flugel), Cecilia Bignall (cello), Misha Mullov-Abbado (bass) and Scott Chapman (drums/percussion). The gig takes place at the wonderful Omnibus in Clapham, who have been running jazz, and supporting young musicians, for several months now. The centre is just a few minutes walk from Clapham Common tube (maps here). The bar will be open, with doors at 6.30 and music from 7. One week to go to the Mosaic debut! Parlamentary - Jazz album of the year goes to.... US! The coming weeks and months feature a number of gigs for Element, including a performance at the Vortex. Tomorrow night (15th April) we play at the Amersham Arms, home of the SE Collective. Then, this Friday (18th April) we’re doing a free performance in the foyer of Kings Place. For more information on these gigs, and more, see the Element website. There’s a lovely review of the JTQ + Big Band + Percussion + Choir (!!) gig at the Queen Elizabeth Hall by Sarah Chaplin on the London Jazz Blog. Post by Samuel Eagles Quartet. Proud Camden, Sam Eagles in the QEH Front Room, and introducing Ralph Wyld's Mosaic. This Sunday (9th March) I will once again be playing at Proud, in Camden. The band features Ellie Bignall on vocals, Flo Moore on bass and Ben Brown on drums, and we are playing 3-6. Entry is free, and there is more music happening throughout the afternoon/evening. Also, on Friday 14th, the Sam Eagles Quartet is playing in the QEH Front Room from 5.30. Again entrance is free, and we’ll be playing music from the quartet’s soon-to-be-released debut album, signed by the renowned F-IRE Label. Finally, I have formed a new ensemble, Mosaic, and we are currently in rehearsal for the first public performance on 8th June at Omnibus Arts Center, Clapham. I’m pleased to announce a new Element date for the diary: we will be playing on Wednesday 6th November at the Orange Tree in Richmond, in Flo Moore’s first performance as a member of the Way Out West Collective. Also, I’m involved (both playing and arranging) in a gig at King’s Place on Saturday 9th November. The evening is a celebration of the music of Kenny Wheeler, and features two ensembles from the Royal Academy of Music with guests Nikki Iles and Stan Sulzmann. I also have a very busy London Jazz Festival lined up this year and I’ll write about that soon. Troyk-estra on Jazz on 3 tonight! The set that Troyk-estra played at the Cheltenham Jazz Festival this year was recorded by BBC’s Jazz on 3, and is being broadcast tonight at 11. Be sure to tune in and check out some great music by Chris Montague, Kit Downes and Josh Blackmore. Artie Zaitz Quartet plays Monk, tonight! I’m playing with the Artie Zaitz Quartet tonight at the Shaftesbury Tavern, performing the music of Thelonius Monk, as we did at Ronnie Scott’s a few weeks ago. Very pleased to announce two exciting gigs – one very soon and one a couple of months away. The first is with the Artie Zaitz Quartet tomorrow night (Monday 18th March), playing the music of Thelonius Monk at Ronnie Scott’s. As well as Artie on guitar and myself on vibes, the band features Alex Davies on bass and Shane Forbes on drums. A reminder that tomorrow night, Element make our second Cardiff appearance, this time at Cafe Jazz. The gig is a double bill with the Geoff Simkins quartet, and if you haven’t heard Geoff’s highly creative improvising I strongly recommend you come along and listen. Element made its first performance at Dempsey’s on 15th January, and was very well received by a large crowd. You can hear some of the gig here. As well as playing at the Hackney Cut on Thursday 14th February (how better to celebrate Valentine’s day than with live jazz?! ), I’m excited to announce that we will be also be playing the late set at the 606 Club on Tuesday 12th February. The main act that night is pianist Gareth Williams, and promises to be amazing, so please do come down, or stick around after Gareth! We’re also grateful to Gavin Dando for some great pictures of the Cardiff gig. Firstly, I’m very pleased to be able to announce that Element will be making its debut gigs in the next few weeks. The first is at Dempsey’s in Cardiff on Tuesday 15th January, followed by the London debut on Thursday 14th February at the Hackney Cut, in a double bill with guitarist Graham Garside. Read more about the trio here. More exciting news for the trio, is that we will be sharing a gig with Geoff Simkins’ band, at Cafe Jazz in Cardiff, on 7th March. The Sam Eagles Quartet has more gigs lined up: The Long Room Bar and Hotel in Tooting hosts a weekly gig and jam, on Thursday nights; plus we’ll be sharing a double bill with Duncan Eagles’ group Partikel at the Spice of Life, on 21st February. Finally, I’ll be playing with the Rick Simpson Sextet on 24th January, again at the Spice. Thursday nights once again have live jazz from the Sam Eagles Quartet! The Long Room Bar and Hotel are hosting a jam every Thursday night starting this week (29th November). The first set will feature some Sam Eagles originals, then the stage will be opened for a jam. Unfortunately the Sam Eagles Quartet gig at The Frog on Thursday nights has been cancelled, starting this Thursday. However Sam’s hopeful that a replacement gig will start somewhere else soon, so keep an eye out for news! Tonight with the Rick Simpson Sextet! I’ll be playing tonight with Rick Simpson’s Sextet, at the Amersham Arms. The first set will feature quartet music from his new record, and the second is all new compositions. Check Rick’s music out here. I’m very pleased and excited to announce two gigs with a couple of well-established ensembles. The first is with Threads Orchestra, with whom I’ll be playing at the 2012 Freedom Festival in Hull. The gig takes place on 8th September on the E20 Yellow Bus Stage. The second is as a guest with the Tim Richards Trio, recreating music from his Great Spirit band. This is at Kings Place on 13th October. Also, I hope to announce very soon a couple of dates with a new trio featuring Rod Oughton and Flo Moore, so check back soon for more info. Welcome to my new site, where it’s now easier to keep track of what I’m up to. Thanks for checking the new site out, and hope to see you at a gig soon!